About Us | Pro Deck Installers Inc.
Hello, I am the owner of Pro Deck Installers, Inc., We are a licensed, bonded & insured professional construction company that performs exterior home improvement projects with an emphasis on deck building & perfection. We will manage your project thoroughly from start to finish. We will provide any drawings needed for HOA approval, pull the necessary building permits, schedule, oversee and comply with all of the necessary building inspections to ensure that your deck is both safe and code compliant. For 15+ years our goal has been to impress each customer by providing an exemplary product and service. We value and appreciate the opportunity given to us each time a client elects to put their trust in our company. We work hard not to violate that trust by operating with a high level of integrity. Thank you for choosing Pro Deck Installers, we look forward to working with you. Gerry is a great communicator. They were the best estimate and completed it on time and on budget. He knows his stuff. Chantilly, VA., "Our favorite client"
Experience from start to finish was very positive. Gerry had good plan for type of deck that was needed for my situation and even suggested a color that tied in the colors of my roof and paint colors that turned out even better than I expected. The workmen were very skilled and organized and completed the deck in the time estimated. I am very happy with my very sturdy and beautiful deck! Blue Ridge Ave. Annandale VA., "The new deck has composite flooring, & railing top, aluminum balusters". Gainsborough Drive, Fairfax VA., "K.H - Removed old deck and installed a beautiful new Trex,Transcends deck". "We chose Pro Deck primarily based on many positive reviews on Angie's List, but it was also comforting that their bid was similar (even somewhat lower) than the two other bids we received. I am so grateful to Pro Deck for their excellent workmanship and professionalism that has provided us with such a high quality, beautiful deck." Home Guard Drive VA., " Removed old wood deck and built a new, deck including new footers and posts. 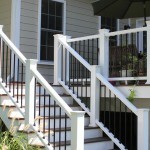 The new deck has composite flooring, & railing top, aluminum balusters." "Everything about this project went extremely well. Not only are we thrilled with our new deck, but it was a pleasure working with Gerry (owner) and his crew"
Hatmark Ct. Vienna VA., "Removed our old deck and put up a new maintenance free Trex deck." "It went very well from start to finish. Work was done professionally and efficiently in more than a timely manner. His team worked very hard and Gerry was great with keeping me updated as the project progressed. 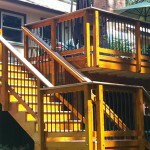 I will definitely recommend Pro Deck Installers to anyone in need of a deck project." Governors Pond Circle VA. , "Replaced two old decks with two new beautiful decks"